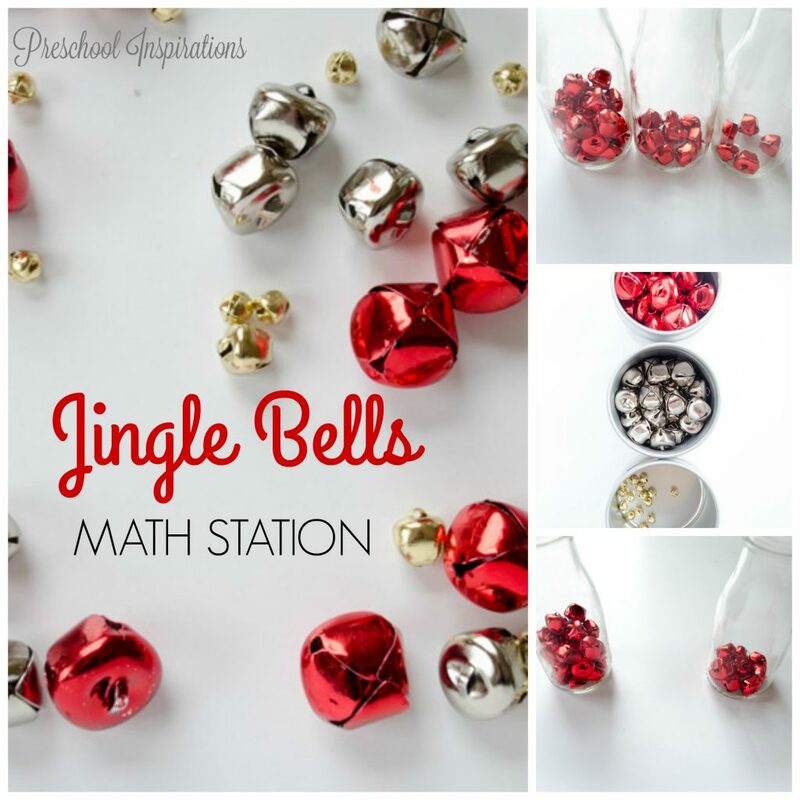 Make this inviting and simple jingle bells math station in a cinch! Can you believe I said inviting and math in the same sentence!?! I mean I like math — but I know not all of us do. 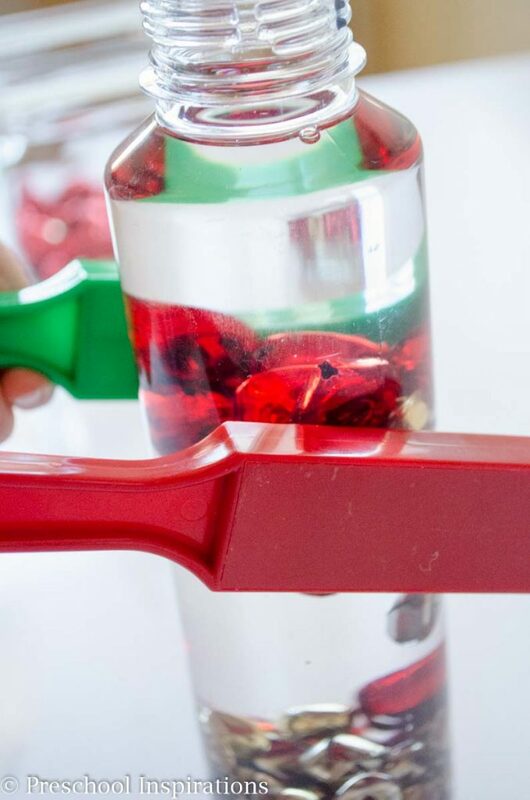 These jingle bell activities are irresistible though, and since I am a fan of quick and easy setup, there is no hard work on your part. 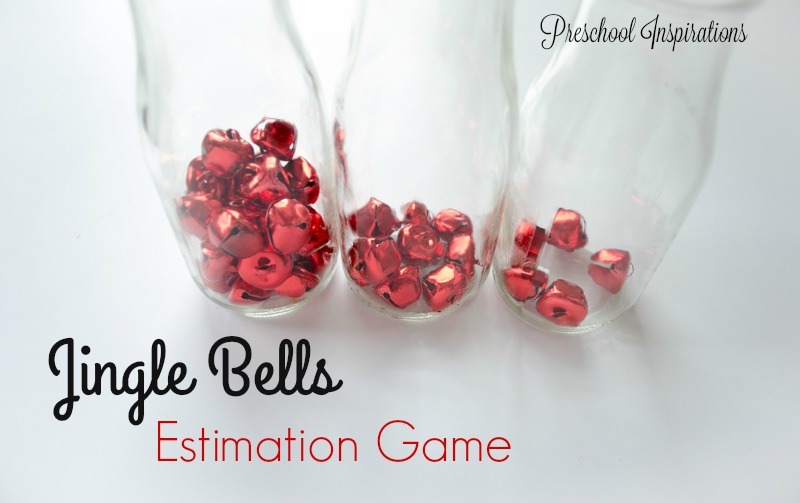 I remember playing estimation games from my childhood, and they are still loved by children today. This was how I set it all up. I used three glass jars, recycled Starbucks frappuccino jars, and I added bells into each container. Yes, I did just give you permission to get some delicious drinks to make this awesome math game. 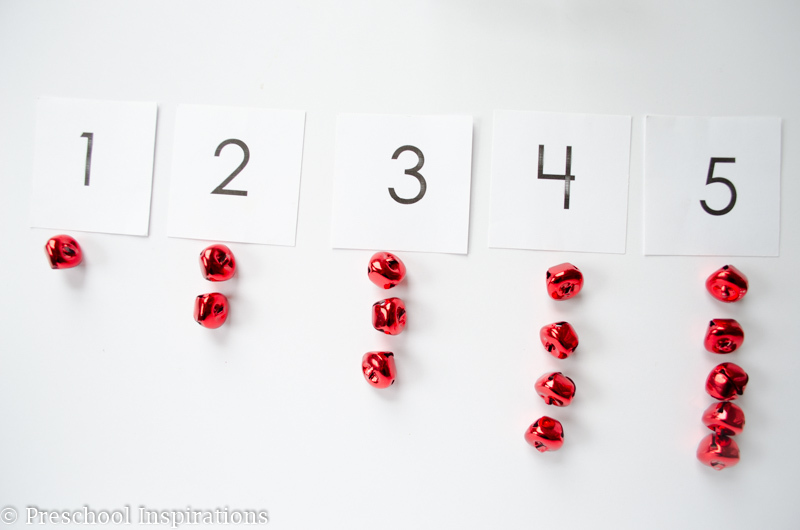 For younger children, you may want to put the numbers out on separate pieces of paper, but scramble them so they are not in front of the correct jar. I did this game with my five-year-old son, so it’s a bit more tricky than I would make it with a three-year-old. Overall, it should be fun…no pressure to get the answers right. The second jar is hiding some in the picture so add a couple more to that guess. Here are the answers, from left to right: twenty-five, ten, and five. Did you get any of them? See, isn’t this game so fun! 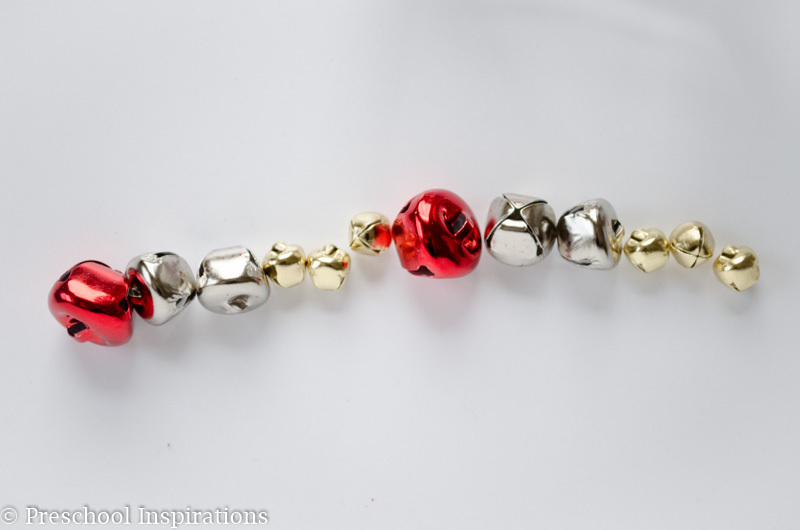 This jingle bells pattern game is great for children of all abilities. You can make the pattern simple or complex, depending on where the child is at. My son resisted all of my patterns and wanted to make his own. I’m all for that too! Sorting is so inviting and great fine motor practice. I planned to do this by size, but it turned out being by color at the same time. Technically, I do prefer to do color sorting with items of the same size. My Montessori mentor friend explained that to me once, and I thought it made perfect sense. 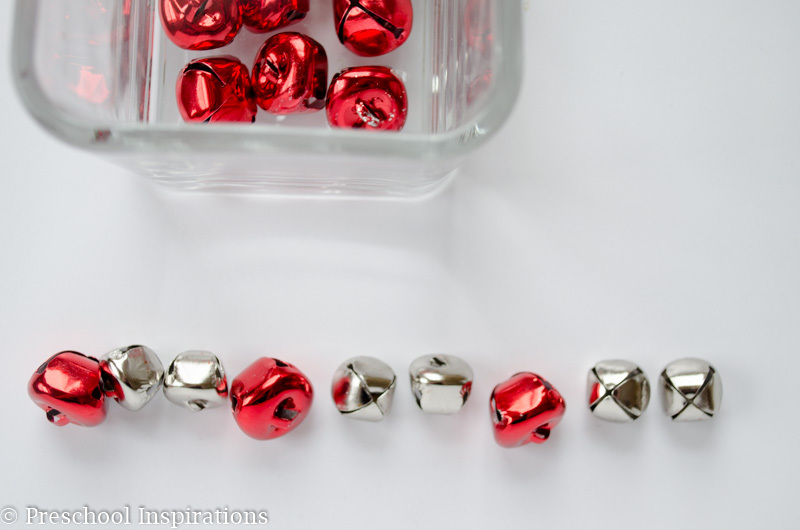 This time my bells are in magnetic spice tins, which are also great for tons of other activities. We love to put letters on the top of them and add objects that start with that letter sound in them too. 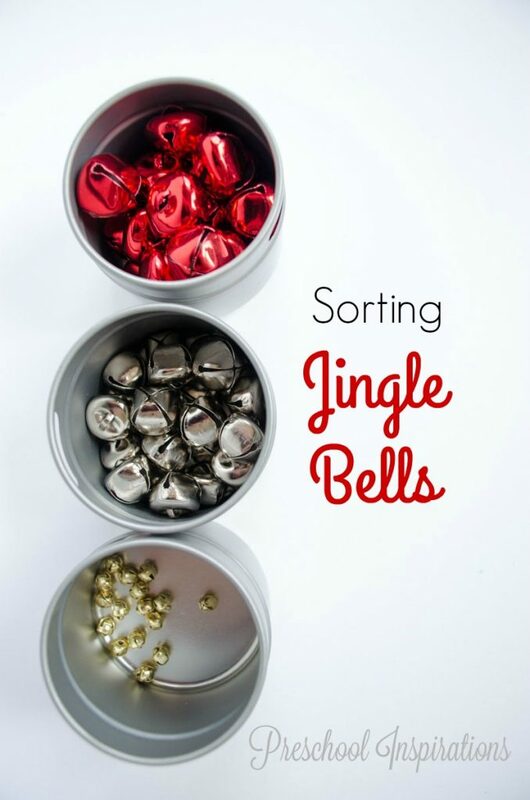 If you are looking for an excellent jingle bells coloring sorting game, go check out Stay at Home Educator! This game is one that we love to do for each new theme. We just change out the items each time. Just put the numbers out and a container of bells, and tell the students to put the bells below the number. Or if you’re like me, you would say to put it underneath the number…and then realize that the child is much better at positional words than yourself! Our last game is another is a more or less comparison game. Again I used the Starbucks frappuccino jars. For older children or ones who want a challenge, it would be fun to use different sized and shaped containers! Another fun twist would be to add a piece of paper with the < sign. 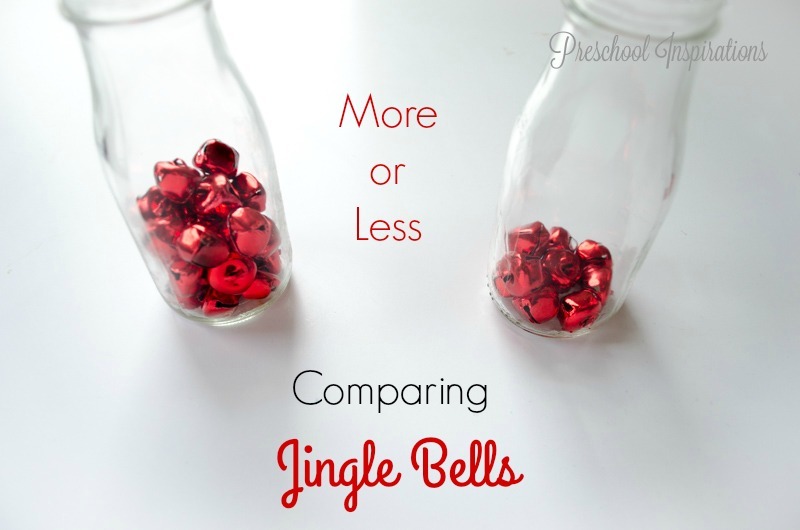 Then have the child “eat up” the jar with more jingle bells. If you want even more jingle bell fun, here is my jingle bells discovery bottle. You can read all about my tutorial on it and why NOT to use water :).